Karol Wojtyla, cardinal of Krakow, Poland, was elected the 263rd pope in 1978, the first ever of Slavic blood. He took the name John Paul II. Karol Wojtyla was born May 18, 1920, in Wadowice, Poland, the second child of Karol Wojtyla Sr., an army sergeant, and Emilia (Kaczorowska) Wojtyla. His mother died when he was nine. 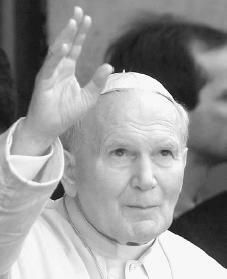 After his mother died, Wojtyla became closer to his father, whom he credits as the source of his religious faith. His only sibling, a much older brother, Edmund (a physician), died four years later; and Karol Sr. died in 1942. These sorrows of early family life, along with the hard times that Poland experienced both prior to World War II (1939–45; a war fought in Europe, Asia, and elsewhere with Great Britain, the Soviet Union, France, the United States in 1941, and their allies on one side; Germany, Italy, and Japan on the other side) and throughout it, were bound to give an intelligent young man reason for serious thinking. Nonetheless, he has been remembered by his peers as a positive-thinking young man who was involved in sports such as soccer and skiing. In 1939 under Nazi (Adolf Hitler's [1889–1945] political party, which was in power in Germany from 1933 until 1945) occupation, he enrolled at Jagiellonian University in Krakow, and shortly thereafter he began secret studies for the priesthood. Publicly, however, he worked as a laborer in a quarry and a chemical factory. After World War II, upon ordination to the priesthood on November 1, 1946, Wojtyla did pastoral work with Polish refugees in France and then did graduate studies at the Angelicum University in Rome. When he returned from these studies to his native Poland, Wojtyla was assigned to parish work and soon became well known for his successes in youth ministry. He was then assigned to teach ethics (the study of right and wrong) at the Catholic University of Lublin, and in 1958 he was officially named auxiliary bishop (member of the clergy who assists the bishop) of Krakow. In 1962, upon the death of Archbishop Baziak, Wojtyla became the vicar capitular, or administrative head, and in 1964 he became archbishop of Krakow. Paul VI made him a cardinal on May 29, 1967, in good part because of the fine impression he had made during the Second Vatican Council (1962–65). the land more harm than good. The Communist government came to look upon him as an enemy. First as bishop and then as archbishop and cardinal, Wojtyla fought for the Church's right to full religious practice and expression of opinion. During the Second Vatican Council Wojtyla had contributed to the Catholic Church's increased appreciation of religious freedom, and he impressed many of the Church's leaders as a strong leader with firsthand experience of the possible effects of Communist rule. When Pope Paul VI died in August 1978, and then scarcely a month later his successor, Pope John Paul I, died unexpectedly, the stage was set for a more dramatic occurrence. On October 16, 1978, on their eighth ballot, the cardinals assembled in Rome for the papal election chose Wojtyla as the first non-Italian pope in 455 years and the first Slavic pope ever. The new pope, who chose the name John Paul II in honor of his immediate predecessors (John XXIII, Paul VI, and John Paul I), quickly became a powerful figure. Pope John Paul II began a papal life of activity. In January 1979 he made his first trip abroad to Latin America. For nine days in June of 1979 he walked in the midst of Eastern Europe. At the end of September 1979 the pope flew first to Ireland and then to the United States, bringing his message of justice, peace, and the righteousness of traditional Catholic morality. After these early trips Pope John Paul II became the most travelled pope in history. The personal danger of these trips became apparent to the world on May 13, 1981, when the pope was shot in Rome by a Muslim fanatic presumed to be employed by the Bulgarian Communist government. Not long after his return to health he began planning for future trips, telling his aides that his life belonged to God and the people. Pope John Paul II's first encyclical (a letter that is written by the pope and addressed to the bishops of the church), Redemptor Hominis (Redeemer of Man), came in March of 1979, only five months after his election. It was a piece that clearly expressed the pope's belief that the redemption (act of being saved) offered in Christ is the center of human history. The second encyclical, Dives in Misericordia (Rich in Mercy), appeared in December of 1980. Its theme was the mercy of God and the need for human beings to treat one another mercifully, going beyond strict justice to the love and compassion that human suffering ought to create. The third encyclical, Laborem Exercens (Performing Work), appeared in September of 1981. This encyclical made it clear that the pope, for all his anti-Communism, is no friend of traditional capitalism. Moreover, the pope echoed the traditional Christian teaching that the goods of the earth come from the Creator God and are for all the Earth's people. The pope's 1988 encyclical, Sollicitudo Rei Socialis, on social justice is thought to be one of his most substantial documents. It threaded a middle ground between capitalist and socialist positions, arguing for both proper economic development and placing the needs of the poor over the wants of the wealthy. In 1992 the pope approved a new catechism. This was a detailed statement of belief meant to unite the Catholic Church. In October, John Paul published a large encyclical on moral issues somewhat inspired by the pedophilia (the sexual attraction of adults to children) crisis in the United States: Veritatis Splendor (The Resplendence of Truth), the burden of which was that the Christian moral life demanded heroism; certain traditional teachings never change; some acts (genocide, abuse of the innocent) are evil; and recent technical developments in moral theology casting doubt on such traditional positions are unacceptable. John Paul departed from his customary encyclical, or papal letter, in 1994 to publish a book, Crossing the Threshold of Hope, which became an international bestseller. John Paul II reached out to the masses, the publicresponded, and Time magazine named him "Man of the Year." The book received wide critical acclaim for addressing today's major theological concerns and further established John Paul as a great intellect and teacher of our time. John Paul issued a strong message in his 1995 encyclical, entitled Evangelism Vitaeor (Gospel of Life). He confronted the issues of abortion, assisted suicide, and the death penalty, making a plea to Roman Catholics to "resist crimes which no human law can claim to legitimize." A second encyclical, entitled Ut Unum Sintor (That They May Be One), was released in 1995. In this letter, for the first time in Church history, he acknowledged and apologized for past sins and errors committed in the name of the Church. Admitting that painful things have been done that harmed Christian unity, he accepted responsibility and asked for forgiveness in the hope that Christians could have "patient dialogue." Church business claimed John Paul's attention in 1996. Several major changes were instituted at his urging; for instance, he ruled that the next pope will be elected by an absolute majority (more than 50 percent). In March 1998 John Paul issued "We Remember: A Reflection on the Shoah," or Holocaust—a papal apology for the Catholic Church's failure to act against Nazi atrocities during World War II. He also continued his travels despite the increased effects of Parkinson's disease. He was the first modern pope to enter a synagogue or to visit an Islamic country. On March 12, 2000, John Paul asked for forgiveness for many of his church's past sins, including its treatment of Jews, heretics (those who deny fundamental beliefs of the church), women, and native peoples. This was believed to be the first time in the history of the Catholic Church that one of its leaders sought such a sweeping pardon. Durkin, Mary G. Feast of Love. Chicago: Loyola University Press, 1983. Frossard, Andre. Be Not Afraid. New York: St. Martin's Press, 1984. Garcia-Cobb, Jo. Pope John Paul II. New York: MetroBooks, 1999. Gronowicz, Antoni. God's Broker. New York: Richardson & Snyder, 1984. Legrand, Catherine. John Paul II: Chronicle of a Remarkable Life. New York: Dorling Kindersley, 2000. Weigel, George. Witness to Hope: The Biography of Pope John Paul II. New York: Cliff Street Books, 1999. Saint Pope John Paul II is a great inspiration to everyone! John, Elton Johnson, Lyndon B.